Alongside device support, the Philips Cares app offers caretakers shared reminders, access to emergency services and data analysis features. This week at CES 2019, Royal Philips unveiled a new app platform that links the company’s senior care products into a single digital ecosystem for family caretakers. Called Philips Cares, the app includes a range of features to track and manage a senior’s care, such as reminders, scheduling tools and access to emergency services. Philips’ existing Lifeline products for senior care include GoSafe — a pendant wearable that supports location tracking, fall detection and two-way communication — the HomeSafe medical alert system and the in-home Automated Medication Dispensing Service device. Philips Cares integrates each of these products into a single interface that can allow family caretakers to, for instance, view minute-by-minute step counts or medication adherence. These records can be viewed by multiple family members or other caretakers, who can also manually add notes or reminders to help coordinate care. Other features of the service include bill and payment information management, device operation support, data analytics for inference generation and access to other Philips senior care services. Broad said that Philips is planning to release the initial version of the app in the earlier part of this year. 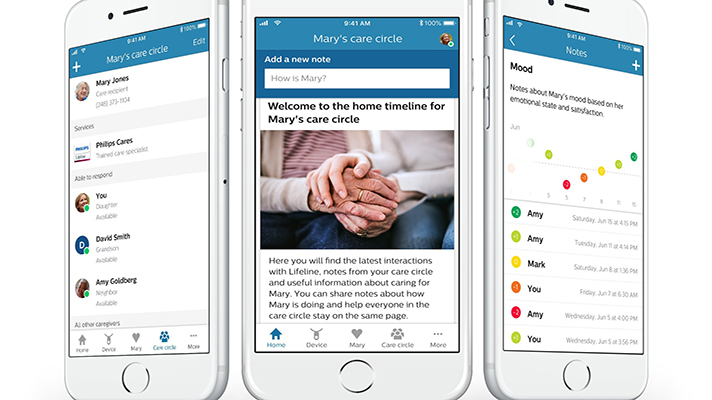 While the platform will be ready for use by family caretakers right at launch, the company will also be layering additional functionality professional caregivers in the following updates. Demographics are shifting as a growing proportion of the US population is entering its twilight years. The continuously understaffed senior care industry’s capacity to face the silver tsunami could very well rely on the impact of technologies that help shift the burden away from trained professionals and specialty living centers. With this in mind, Philips’ new platform has an opportunity to be a consumer-friendly service hub for seniors hoping to live comfortably in their own homes, and family members who want to help them do so. Many of the newest remote monitoring tools and other home care technologies have found themselves right at home in the senior care market. The past year alone has seen at least one major health tech acquisition with Best Buy’s acquisition of GreatCall, while many senior-focused tech companies such as K4Connect and Kindly Care have also seen fresh support from investors.